Miss Marie Bertin operated a photographic portrait studio at 42a Cannon Place, Brighton from 1886 until 1889. Marie Bertin was the daughter and, apparently, only child of Eugenie and Louis Bertin, the French-born Brighton photographer. Marie was born in France between 1854 and 1856. ( At the time of the 1871 census, Marie's age was given as 17, but in the 1881 census, her age is recorded as 25. Marie and her parents, Eugenie and Louis Bertin, arrived in England from France sometime in the 1860s. When the 1871 census was taken, the Bertin family were residing in South London at 6 The Pavement, Clapham Common, where Louis Bertin worked as a photographer and tobacconist. After a brief period in Tunbridge Wells, Kent, in 1874 Louis Bertin and his family settled in the Sussex seaside resort of Brighton. Louis Bertin established a photographic portrait studio on the seafront at 88 King's Road, Brighton. Louis Bertin worked as a professional photographer at this address between 1874 and 1886. Presumably, Marie Bertin, who was aged about 20 when she arrived in Brighton, assisted her father at his King's Road studio. When the 1881 census was taken, Marie Bertin is shown living with her parents at their business premises at 88 King's Road, Brighton. On the census return, Marie Bertin is described as an "Artist", aged 25. Marie might have been employed to hand-colour her father's monochrome photographs or even produce portrait miniatures based on the small photographs produced at Bertin's studio. ( Around 1884, publicity for the studio at 88 King's Road describes the nature of Bertin's business as "Photographers and Miniature Painters" ). The fact that Louis Bertin's daughter went on to set up her own photographic studio in Brighton supports the idea that Marie Bertin also worked as a photographer's assistant or camera operator at Bertin's King's Road studio. [ABOVE] The Jester's Bluff, an oil painting by Marie Bertin (1884). On the 1881 census return, Marie Bertin is described as a twenty-five year old "Artist". Searching for examples of Miss Bertin's work, I have found a record of a small oil painting (measuring 9 1/2 in. x 14 3/4 in.) entitled "The Jester's Bluff", which was sold at auction in 2006. The painting is signed "Marie Bertin, 1884" in the lower left-hand corner. However, the painting also carries the name of the city of Paris and, therefore, it might be the work of a female French artist who happens to share the same name as the Brighton-based artist and photographer, Miss Marie Bertin. Around 1885, Miss Marie Bertin established her own photographic portrait studio in Brighton in Cannon Place, a street that leads off from King's Road on the seafront. Page's Directory of Brighton, published in 1886, lists Marie Bertin as the proprietor of a photographic studio at 42a Cannon Place, Brighton. Miss Bertin is recorded as photographic artist at 42a Cannon Place, Brighton in various local trade directories issued between 1886 and 1888. Pike's 1889 Directory of Brighton lists the proprietor of the photographic studio at 42a Cannon Place as Madame Rivers. There is no record of Marie Bertin marrying in England, so we must assume that Madame Rivers is not the married name of Marie Bertin and that Madame Rivers the photographer was a different person. 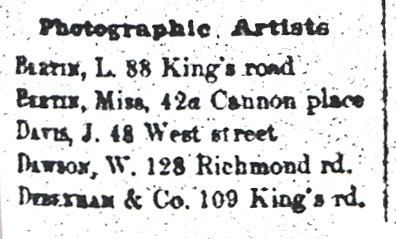 Kelly's 1890 Sussex Directory, records the proprietor of the photographic studio at 43 Cannon Place, Brighton, as "James E. Mayall", which is clearly a typographic error and should have shown the name "John E. Mayall". John Jabez Edwin Mayall (1813-1901) was a nationally famous photographer who had operated a photographic portrait studio at 90-91 King's Road, Brighton, since 1864. Page's 1890 Directory of Brighton, correctly lists the proprietor of the Cannon Place studio as J. E. Mayall, F. C. S., F. R., M.S. but gives the studio address as 45 Cannon Place, Brighton. After a couple of years the studio was closed and the building at 45 Cannon Place was being used as a Post Office. [ABOVE] Louis Bertin and Miss Marie Bertin listed under 'Photographic Artists' in the Trades section of Page's 1886 Directory of Brighton. [LEFT] Page's Directory of Brighton, published in 1886, listed Louis Bertin and his daughter Marie Bertin as photographic artists based at different studio addresses in Brighton. This trade directory entry is one of the last records of Louis Bertin as a photographer at 88 King's Road, Brighton. The next edition of Page's Directory of Brighton, published for the year 1887, does not mention Louis Bertin as a photographer in Brighton but Miss Bertin of 42a Cannon Place, Brighton, heads the list of photographic artists in the seaside town. [ABOVE] A possible portrait of Marie Bertin (c1874). 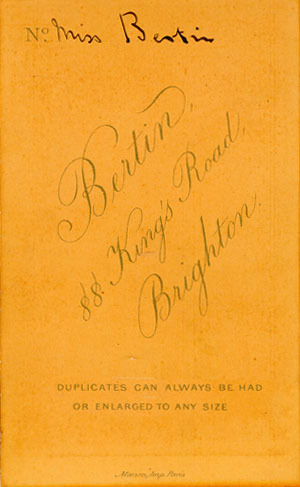 The reverse of this carte-de-visite photograph issued by Bertin of 88 King's Road, Brighton, is inscribed in ink, in a contemporary hand, "Miss Bertin". 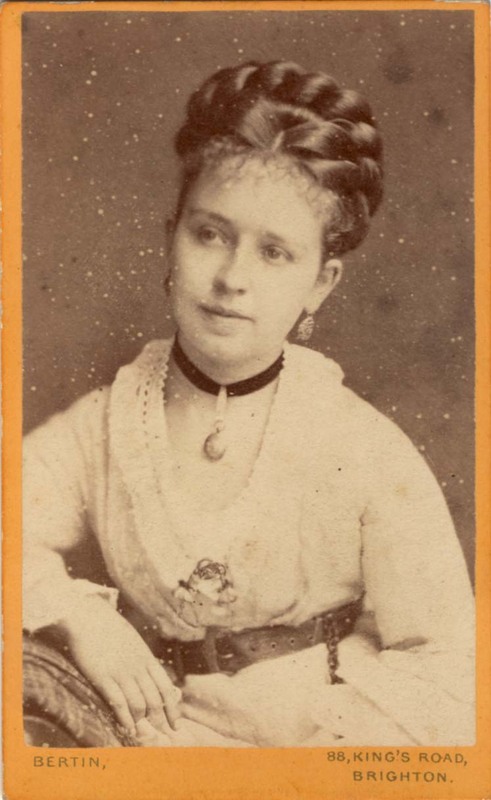 [ABOVE] The reverse of the above carte-de-visite portrait showing the name "Miss Bertin" written in ink in the space usually reserved for the negative number or picture reference (c1874). [ABOVE] A late Victorian map showing the location of Louis Bertin's photographic studio at 88 King's Road, Brighton (marked by a red dot) and Marie Bertin's studio at 42a Cannon Place, Brighton (marked by a blue dot).